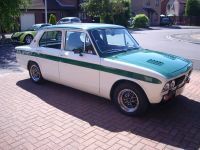 All polybushed gaz shocks alround and totally rebuilt engine (by Mad Mart) includes fast road cam brand new Weber twin 40 setup both carbs and engine never used, Ali coil radiator electric fan fitted. Powder coated front subframe all new ball joints etc. Not decided on prices yet but will sort soon if there’s some interest here before I put n eBay. Hi John, long time no speak. It's a shame you have to sell the Sprint, you've put a lot of work into it. BTW the engine was rebuilt with mostly new parts. Yeah it is a shame, struggling to remember what we put in new lol , haven’t got a clue what to sell the engine for, need to do some research!! Hope you and Mary are both well, did you move house in the end? Surely it will sell easier and for more complete? From the experience of trying to sell a stripped down vehicle previously, the first thing to go is something that renders it immobile and the rest hangs around for ages and simply becomes inconvenient! Got some rust to sort on the back of the roof at the seam then only requires paint and putting wiring in and refitting the interior. All doors, front end has had all rust removed etc and new panels welded in. Engine and carbs have 3k in new parts and about another 3k of other bits at least on the car. Not decided which way is best to go yet. That is a real shame if you have to go this route. I would be interested in the loom and the suspension stuff, but would need posting. I think someone should take this on as a resto to finish first and foremost, just my opinion. But your car and your circumstances will dictate, whatever you do good luck. I am guessing the engine is down in Bristol? and how much do you want for the engine please? I have a second hand Sprint subframe available that doesn’t rely on another car being lost...Stourbridge.